Home » Media » Press Releases » GET. BEYONCÉ. NOW. - Pepsi Unveils Visionary New Global Campaign that 'Shatters' Illusion and Features New Beyoncé Song "Grown Woman"
GET. BEYONCÉ. NOW. - Pepsi Unveils Visionary New Global Campaign that 'Shatters' Illusion and Features New Beyoncé Song "Grown Woman"
MISSISSAUGA, ON, April 4, 2013 /CNW/ - Beyoncé and Pepsi take the ultimate trip down memory lane, only to realize the excitement of the moment is NOW in a new global advertising campaign unveiled today. The creative collaboration, mutually developed by Beyoncé and Pepsi as part of a previously announced global partnership, will debut at 9:00am EDT/2:00pm GMT in a special digital premiere on www.youtube.com/pepsi, followed by airings in more than 70 countries worldwide. The spot, which will be seen by more than a billion people, also features "Grown Woman," an infectious new track from Beyoncé. The ad will debut this month nationally on Canadian television. The global partnership is the next iteration of Pepsi's "Live for Now" brand spirit, which encourages fans to embrace the NOW and be at the epicenter of, and helping to define, pop culture - a mindset shared by both Beyoncé and Pepsi. The spot entitled "Mirrors", one of the first creative collaboration elements of the partnership, sees Beyoncé's most iconic personalities from her past - including "Bootylicious" Beyoncé, "Sasha Fierce" and "Crazy in Love" Beyoncé - go head-to-head in a dance-off in a mirrored studio. As it progresses, Beyoncé recreates her most memorable moves before being inspired to create a fresh, never-before-seen routine. "Mirrors" chronicles Beyoncé's realization that all these experiences and personas helped her become who she is NOW, much like the story of a "Grown Woman" - the perfect visual embodiment of the "Live For Now" brand ethos. "I had so much fun collaborating on this campaign with Pepsi. I got to re-live some of my favourite past characters and looks. It was the first time I saw those costumes in years and it was very emotional," says Beyoncé. "I'm proud of those moments and they all connect in some way and have helped me evolve into who I am today." 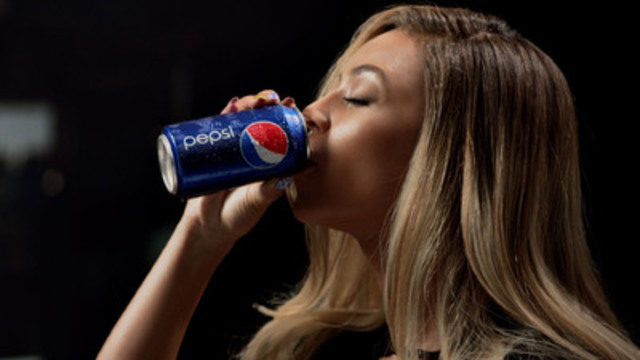 Beyoncé and Pepsi enjoy a long-standing relationship that goes back more than a decade and includes groundbreaking, international campaigns in which she starred alongside Jennifer Lopez, David Beckham, P!nk and Britney Spears. Beyoncé was intimately involved in every aspect of the creative development of this campaign - from the storyline to the overall styling and selection of which 'Beyoncé's' best bring to life the journey she has been on, to become who she is NOW. "There isn't an artist that embodies what it means to "Live for Now" more than Beyoncé. She is a true trendsetter and is at the epicenter of pop culture today, and we couldn't have asked for a better creative partner to bring our shared visions to life. While this advertising is the first phase of our wide-ranging collaboration, we are also incubating a lot of other cool creative content together to entertain our fans, create indelible moments and continue to shape pop culture," said Brad Jakeman, President, Pepsi Global Beverages Group. "Mirrors" was shot in New Jersey (USA), directed by Jake Nava who has collaborated with Beyoncé on numerous projects including the indelible "Crazy in Love" video and filmed by Oscar award-winning cameraman Claudio Miranda. To watch the brand new "Mirrors" advert and find out more on Pepsi's 2013 campaign visit YouTube.com/Pepsi, and for more information visit www.pepsi.com, Beyonce.com and facebook.com/PepsiCanada and @PepsiCanada. Broadcast quality video is available for download by accredited journalists at http://cnw.pathfireondemand.com/viewpackage.action?packageid=700. Director: Jake Nava. He has collaborated with Beyoncé on a number of projects, including directing Crazy In Love. Beyoncé's personal site, in her own word and through her own eyes. The one true voice online for Beyoncé. Broadcast quality video will be available for download by accredited journalists. Please contact video@newswire.ca for access.